At the recent Christie's auction on the 24th of November in Paris a bracelet by Suzanne Belperron (1900-1983) set a record for her work with a final gaveled price of 247,000€. 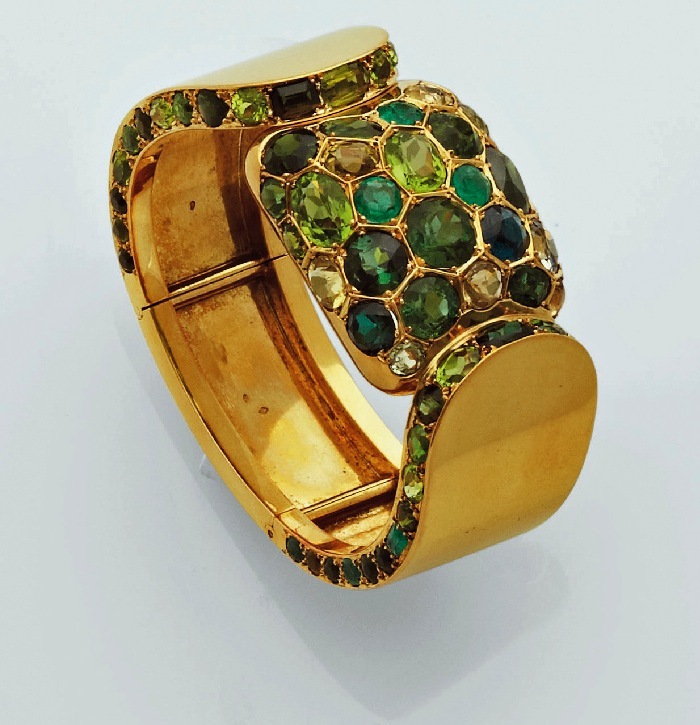 The piece is of yellow gold set with tourmalines, peridots, emeralds, beryls and sapphires, all similar shared of green. 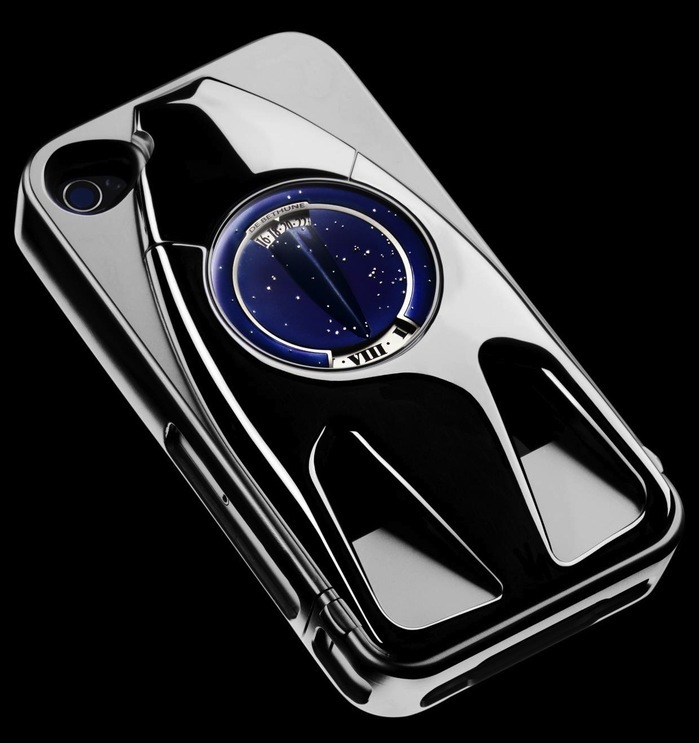 DeBethune (previously mentioned) has released the 4th in their "Dream Watch" series, in this case not a wristwatch, but a watch mounted in a carved iPhone case. A limited edition of 12, this takes the basic design of their piece (the DB25) from the 2011 Only Watch auction and mounts it in a carved titanium iPhone case. 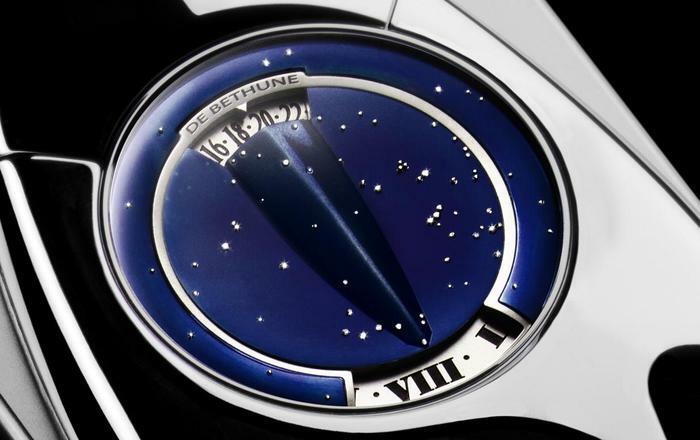 The dial of the watch, which is removable, is blued Ti, representing the night sky, set with white gold and diamond "stars". The Titanium case is in the shape, vaguely, of a rocket ship. Second one shows the watch in close up. The hours are read from the lower (6 o'clock window) and the minutes from the top, so currently it is 8:19 according to this watch. 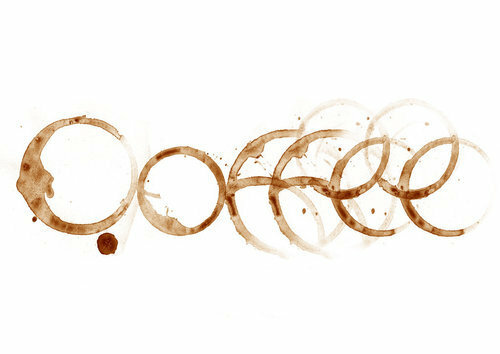 Sometimes a clever design doesn't need to have anything new or complex, just the proper use of a technique. 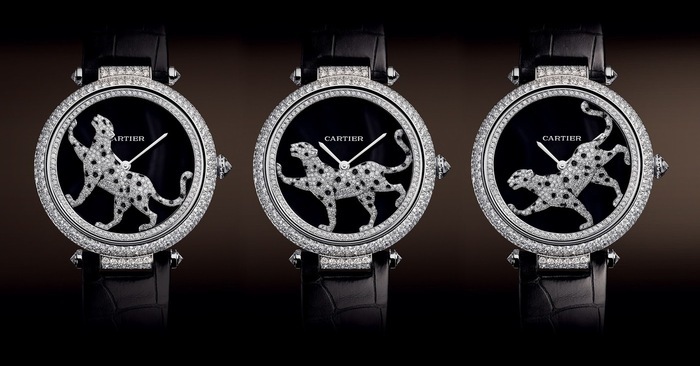 In this case, Cartier seems to have achieved that by reversing the usual layout of an automatic movement and putting the oscillating weight on the front, decorated with a panther (of course). That allows the cat to run around the dial at will, depending on the motion of the wearer. It's a pitty they went a bit overboard with diamonds on the case, but that does seem to be their MO these days. 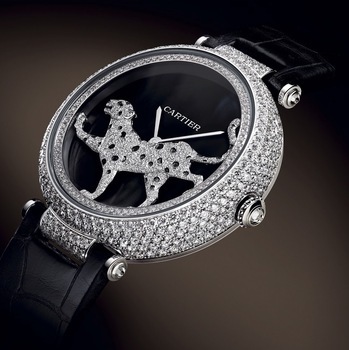 Specs are: 42mm diameter 18k white gold case set with 6.8ct of diamonds. 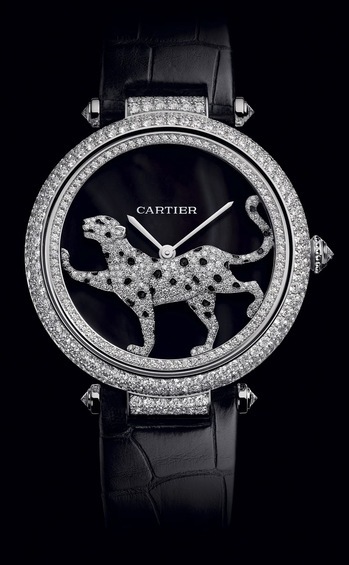 The dial is deep-purple mother-of-pearl and the rotor-cat is set with diamonds and black lacquer spots. Movement is the in-house MC 9603, a 16 ligne automatic with 31 jewels and a 48 hour power reserve. First two pictures are the dial and case of the watch. 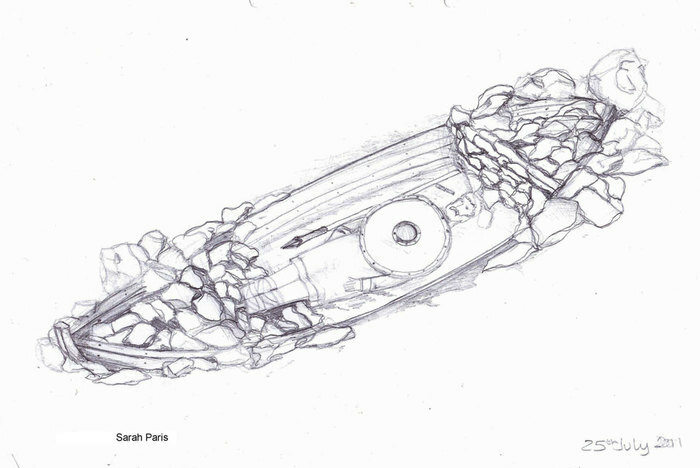 The right-hand picture shows the thickness of the case needed for the dial-side rotor. As I've been talking about the upcoming auction (here and here), I thought it might be interesting to take a look at some photos Life has collected of them in situ. 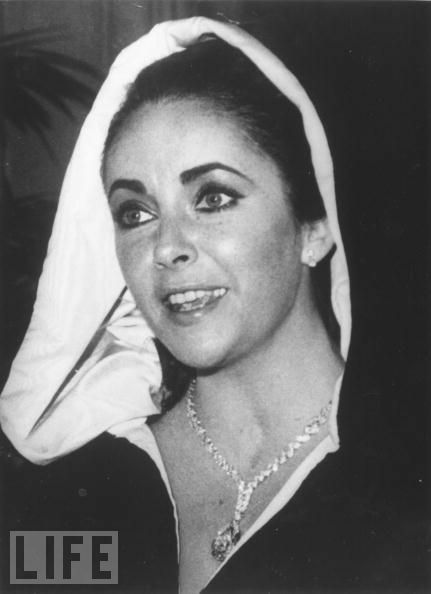 Wearing the 69.42-karat Taylor-Burton Diamond for the first time in public on November 16, 1969. 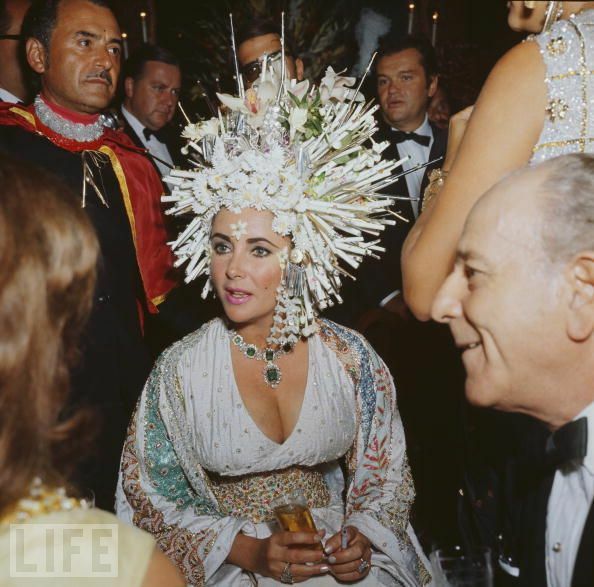 The occasion was Princess Grace's 40th birthday party in Monaco. 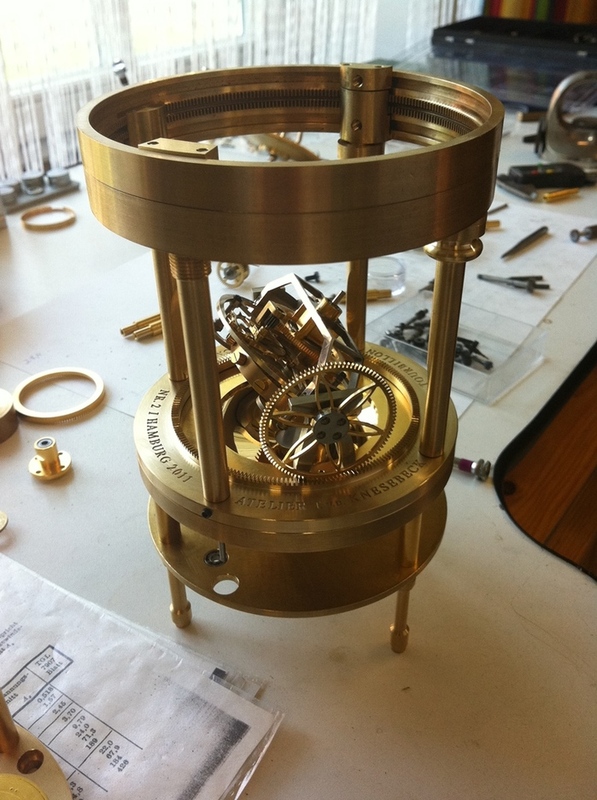 From Tilmann von dem Knesebeck of the Atelier Knesebeck in Hamburg comes some preview pictures of the forthcoming TK7, a horizontal "Triple Aces" tourbillon desk clock. 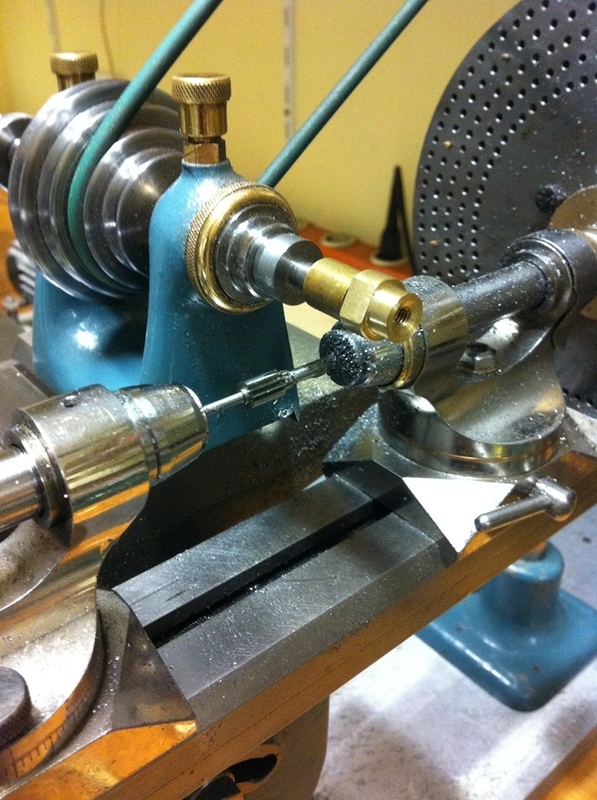 First we have the cutting of the leaves of a pinion, using 2 lathes. The blue lathe is driving a pinion cutter (a 1 toothed saw) and the shiny chrome lathe is using a dividing plate to equally space the leaves. 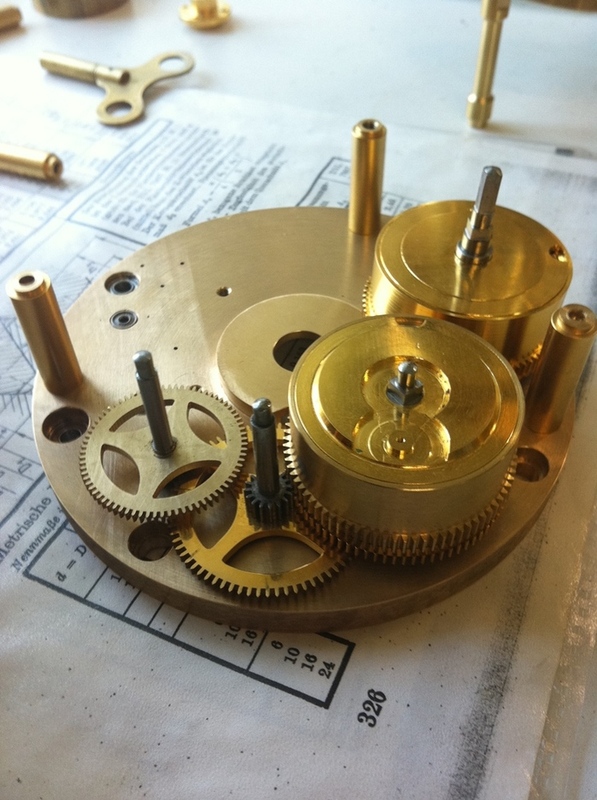 Part of the motion works of the clock, showing the double mainspring barrels. On the nearer one you can see a small cut-out near the center for a maltese-cross type stopwork. Finally the clock in progress!